Whether your indoor percussion floor is large or small, we can help design a floor cover to meet your needs. 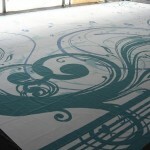 All our floor covers are custom made and are offered in many different sizes, weights, and colors. Digital floors are also available — contact us with your design ideas and for more details.